The exterior of a historic building along the waterfront in Woody Point in Gros Morne National Park in Newfoundland, Canada. On the historic property in Woody Point in Newfoundland, Canada, the Roberts Store is easy to find as it sits along the waterfront and the exterior is brightly painted in red and white. Old wooden windows and the door add to the uniqueness of this historic building and inside there is a world of excitement to explore. The building is always inspected for any further wear and tear which might appear and the exterior looks almost new with its coat of paint. Roberts Store a Historic Property in Woody Point, Gros Morne National Park, UNESCO World Heritage Site, Viking Trail, Trails to the Vikings, Highway 431, Northern Peninsula, Great Northern Peninsula, Newfoundland Labrador, Newfoundland, Canada. 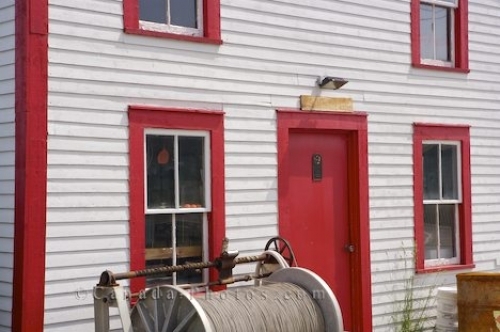 Picture of the historic exterior of a building and the equipment in Woody Point in Newfoundland, Canada.